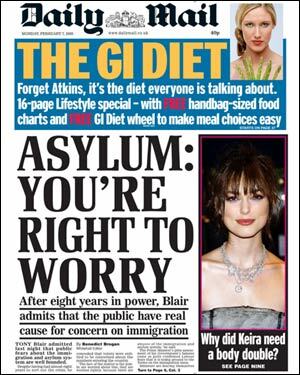 According to opinion polls, asylum continues to be one of the most important issues for the British public. It is rarely out of the newspapers and is the subject of intense political and public debate. "JET SET ASYLUM SEEKERS: £3K TO QUIT AND FLY BACK"
The Home Office has for some time operated a scheme to support asylum seekers who voluntarily return to their country of origin. As a pilot, this has been increased to a possible total of £3,000 – but this is not all paid at once but in a series of grants as the individual shows that s/he requires support to set up in his/her country of origin - for example, they will often be homeless. It is not paid as cash and could not be used to fly back to the UK. In the event of a second application for asylum, the asylum seeker would not be eligible for this support. Even if the maximum amount were paid out, it would be three or four times cheaper than an enforced removal. "ASYLUM CRISIS AS AMNESTY DEAL FOR 15,000 TURNS INTO STAMPEDE"
There was no crisis. Applications for the amnesty are made in writing - no-one was stampeding anywhere. Since it was announced in October 2003, the Home Office has found that more families are eligible for leave to remain than they had originally expected, having been in the UK awaiting an asylum decision for over three years. "ASYLUM SEEKERS SENT TO MORE AFFLUENT AREAS"
The reality is that most asylum seekers’ accommodation is in ’ghettos‘ in deprived areas. They are housed in poor quality accommodation – often previously hard to let – sometimes in areas where research has shown they are more likely to face racial harassment. A Home Office report looking at the problems caused said there might be a case for changing the policy so that some asylum seekers would be sent to relatively less problematic areas. "BRITAIN IS THE ASYLUM CAPITAL OF THE WORLD "
The UK is home to just 3% of nearly 9.2 million refugees world-wide. Two thirds of the world’s refugees are living in developing countries, often in refugee camps. Africa and Asia between them host over 70% of the world’s refugees while Europe looks after just 22%. In 2005, the UK ranked 14th in the league table of EU countries for the number of asylum applications per head of population. A report by the Association of Chief Police Officers stated that the “vast majority of people seeking asylum are law abiding citizens.” In fact, asylum seekers are much more likely to be the victims of crime than the perpetrators. A study conducted by Refugee Action found that one in five of their clients had experienced some kind of harassment while 83% of asylum seeking women do not go out at night for fear of being abused and harassed. "ASYLUM SEEKERS GIVEN VOTES TO GET LOANS "
Asylum seekers are not allowed to vote in local or general elections in the UK, nor do they have any access to loans. People can only register on the electoral roll if they are British, Commonwealth, Irish or EU citizens. Far from getting extra help, asylum seekers receive just 70% of income support (£40 per week). They are not allowed work so are forced to live in poverty. In 2002, a joint Refugee Council/Oxfam report found that 85% of organisations working with asylum seekers said their clients experienced hunger while 95% said they could not afford clothes or shoes. "MIGRANT HEALTH THREAT TO BRITAIN "
The claim that asylum seekers are bringing in disease to the country is a primitive response to outsiders coming in. In September 2003, a pilot screening project conducted by the Immigration Service found that after testing 5,000 asylum seekers for infectious diseases, none carried TB, HIV or AIDS, nor any other serious diseases. Doctors did, however, find evidence of maltreatment and torture.